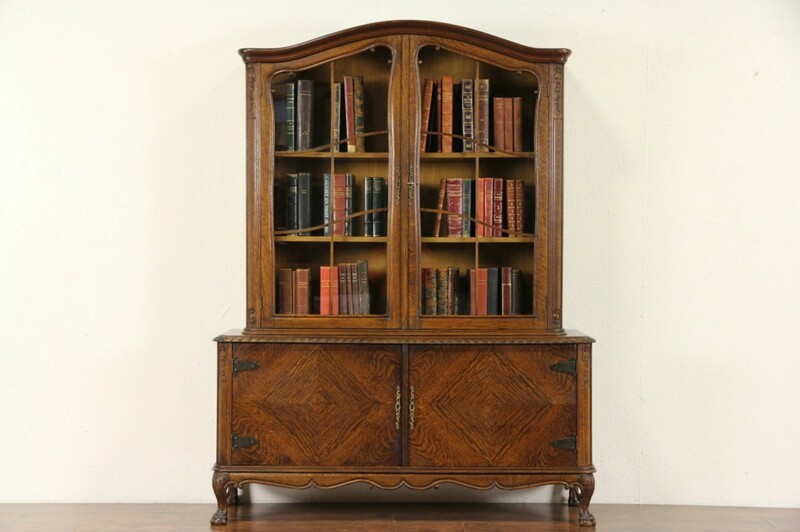 From a country manor in Scandinavia, a 1915 era oak china display cabinet has original wavy glass doors. Hand carved of quarter sawn oak, there are two separate pieces. The top of the base has been revarnished for durability, the rest of the finish is original and very well preserved. Waxed and buffed, all that is needed to maintain the antique patina is an occasional wipe with a soft dry cloth. There is color variation on this finely crafted furniture, see photos. Quarter matched doors and claw and ball feet are authentic. Original locks and keys still work. Measurements are 52" wide, 17" deep and 68" tall.